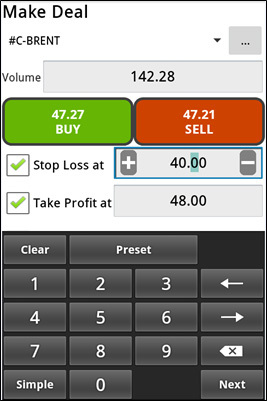 by "Make deal" function from the context menu when choosing a particular instrument in the "Quotes", "Open positions", "Sum open positions" and "Orders". 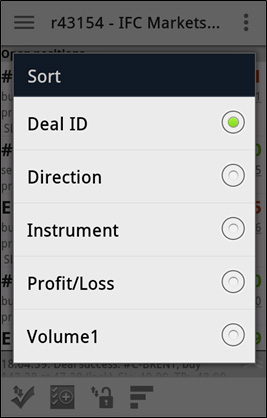 by "Make deal" function from the context menu when clicking the upper-right corner button in the form of 3 points - in this case the list of instruments will open in alphabetic order. by the first button in the bottom toolbar. allowed deviation of the price. In the window two buttons are located - "BUY" (green) and "Sell" (red) with current Ask and Bid prices, respectively. Additionally, you can choose another instrument for the deal from the list of the used instruments (by the button in form of a top down triangle) or from the total list of instruments (by the button in the form of 3 points); both buttons are located in the upper-right corner of the window. When opening the window for the first time its bottom side is closed with a special keyboard for filling out the fields of parameters. Let us note that the movement of the indicator inside the numeric fields is performed by the arrows of this keyboard (to the right and left). If the deal was not set by any reason (for example, invalid volume), reasons for rejection will be indicated in this window. Additionally, you can cancel further notifications about the results, ticking the checkbox "Never show this notification message". 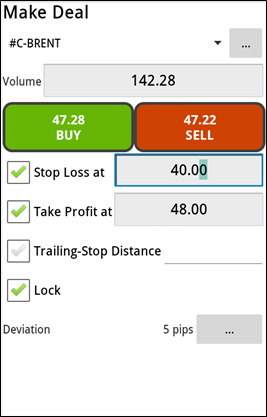 The direction is displayed by "buy" for long positions and "sell" for short positions. 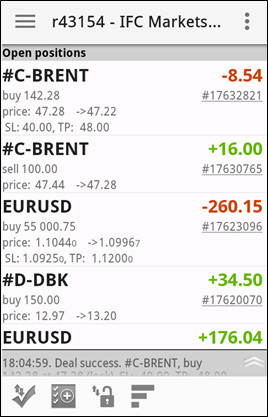 In the field "price ..." the opening and current price of the instrument (for closing a position) are displayed. 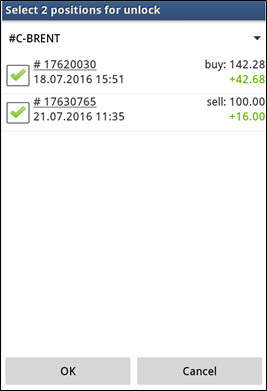 In the bottom field Stop Loss and Take Profit levels are displayed. 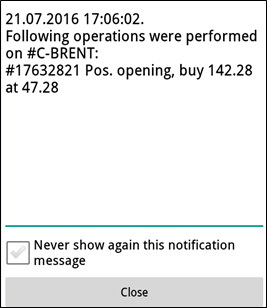 In the right column Profit/Loss results of open positions are displayed in the account balance currency. Moreover, besides the sign, the positions with a profit are highlighted in green, while the ones with loss - in red. Moreover, you can filter them by five features: Deal ID (in fact, by opening time), Direction, Instrument, Profit/Loss and Volume of the asset. In this table you can check several positions for summing and press "OK" to get the result. You can also see the list of open positions with conditional summation of all the positions on each instrument by "Sum open positions" function from the main menu.